1. What is the Digital? The word digital is commonly used to refer to a whole suite of new media technologies that are informed by computational principles. It is often pronounced that we live in a digital age and that our social and aesthetic beliefs are underpinned by the concept of digitality. But when a term is used to herald a broad cultural change it loses much of its specificity and critical purpose. The digital becomes a shibboleth of the new and its counterpart, the analogue, a locus for nostalgia and a presumed indexical connection with the real. We are at a point now, in the study of media and cinema, when it is important to rethink both the analogue and the digital if they are to continue to have any critical value. This is not a plea to limit discussion to technological affordances, for the terms precede the many recent technologies to which they are applied. Rather it is a call to reconsider the digital-analogue distinction as a mode of representation and how this might apply to cinema. This is not just a matter of providing a clear definition in the manner favoured by philosophy, because any theoretical repositioning has to bear some relationship to the material, aesthetic and spectatorial aspects of cinema. The representational differences must affect the way we watch films as well as provide a means for understanding distinct filmmaking practices. In short, it is about redeploying the analogue-digital distinction as a mode of thinking in cinema – in terms of both reason and aesthetics – that extends well beyond the application of specific technologies. To argue that the word digital is subject to a degree of terminological confusion seems misplaced especially when one considers that it has a reasonably precise meaning when contrasted with analogue representation in philosophical and scientific documents. However, there is confusion due to the popular use of the term to describe anything that is produced, recorded and made using digital media technologies. In cinema studies, this is often manifest in references to CGI and other computer based technologies that are increasingly involved in postproduction, distribution and screening. This is certainly acceptable insofar as computational technologies employ digital encoding, but such an approach has the tendency to conflate technological capacity with digital logic. We overly focus on this de facto meaning of digitality because digital encoding is a necessary aspect of computerisation and therefore it is convenient to assume that digitality cannot be separated from computational technology. We should not forget, however, that the term digital precedes the advent of computers and was actually derived from the use of the fingers for counting. Our digits are most suited to marking numerical differences in the world due to their discreteness and because the distal regions stand before our gaze in a way that other parts of the body do not. We can hold our hands up and see the world through the division of the fingers. This separability of parts remains central to the meaning of digitality and in its simplest conceptualisation, it is a mode of inscription that requires clear cut divisions between units. Digitality is primarily a form of representation by which differences, rather than the quality of the whole, are extracted from the real – in the example of the hand, the digits extract the quality of number from objects in the world. Nelson Goodman, in his influential Languages of Art, argues that in digital systems there is a correlation between the syntax of the notational system and the referential field to which it refers (1968: 157). This syntax requires discrete and finite divisions, such as the division of time into seconds on a clock face, and this means there must be ‘gaps’ between the notational marks (ibid. : 158). Digital systems do not only have these notational divisions, they must also refer to phenomena that are discrete: ‘To be digital a system must not be merely discontinuous but differentiated throughout, syntactically and semantically’ (ibid. : 161). This finite differentiation means that whenever a system is created using digital logic, for example a digital computer, it is composed of parts and a notational scheme in which there is ‘complete precision’; it does not admit of any variation in the object to which the notation refers (Goodman 1968: 161). The time on a digital clock, for example, will remain at 6:59 until it clicks over to 7:00 – the gradual procession of time from one minute to the next is excluded from digital counting. Anthony Wilden argues that this dependence on the structured divisions of the notational scheme as a way of understanding the real presupposes a denotative epistemology, or a ‘language of objects, facts, events.’ These denotative objects are either present or absent and this involves the imposition of boundaries in any continuous sensual field to mark out the space that they will occupy (1980: 164-65). For the most part written natural languages are digital because they impose precise divisions between parts of speech: lexically in the division of speech into words, but also phonetically in the division of letters. Similarly, musical notation characterises sonic variation in terms of the digital division between notes, rests and measures. These principles are also central to many philosophical approaches, most notably logical atomism and structuralism, which argue that digital differences are reproduced in the real or are a necessary condition for meaning. The world is only meaningful in the degree to which it can yield such differences, and the role of a theoretical model is to organise these differences and establish a common syntax. The most cited examples of analogue computers are devices such as thermostats which continuously alter the outputted temperature in response to changes in the environment or the governor of an engine, which alters fuel load and other inputs (ibid. : 156). This conception of an analogue system can be translated into a theory of representation if the principle of continuity is maintained, which is central to the ‘iconic’ relationship because the continuity of the material form of the sign matches that of its referent (ibid. : 162-63). This is a feature of photographs in which the surface of the image is continuous with the visual field it refers to, or in cinema where the time of recording alters in direct correspondence with the time of the event. For Wilden, the distinction between analogue and digital communication is complicated by the fact that in human communication there is usually a mixture of the two forms. The resemblances in visual communication are analogue but digital meanings can also be extracted from the continuity of the visual field. In natural languages, alliteration and other correspondences between sounds are analogue, whereas denotation is digital (ibid. : 164), with the semiotic reading of images the most obvious example. Although speech can be written using discrete symbols, these phonetic signs are only an approximation of speech’s highly variable soundscape. Each letter is not pronounced separately and there are variations in pitch and emphasis, such that it is more accurate to say that sound operates in and through the letters. Discreteness and continuity are often used to distinguish digital and analogue representation but another key factor is the form the representation takes. In analogue representation meaning is carried in the physical form of the model or representation, it must be physically instantiated, whereas the digital encodes variables or differences in a way that can be disconnected from any particular physical instance (Blachowicz 1997: 56). To return to the example of the fingers used for counting, although the fingers are undoubtedly physical, it is their separation, a conceptual difference that forms the basis for the higher order of organisation, that is the basis of digital representation. The gaps between the fingers are associated with gaps between numbers and because such a difference is non-substantial, there is no longer the requirement of a physical support. Differences in reality are translated into differences in a language or symbol system, at which point they can be communicated without continued reference to the real. This is essentially the type of differential logic that forms the basis of Saussurean semiotics. This differential logic is also integral to computing, which employs a complex language that is extrapolated from a set of primary differences. This structure of difference is manifest on all levels of the system. On one level we may see the difference between files, folders and lists, at another the division of the screen into pixels and their various colours, and beneath the visible, there are the letters and numbers of the programming language until we finally arrive at the machine code. This differential structure joins together the different languages, for example, we could describe a colour as red and white in a computer application such as a photo editor, already a basic difference, and this could be rewritten in CSS code as #ff0000 (Red) #ffffff (white). Wilden argues that in a truly digital system, there is a ‘double articulation’ for not only is there a primary difference between presence and absence but the recognition that there are multiple ways to communicate this difference (1980: 165) – in this case, colour differences are translated into a difference in code. It is often stated that beneath all the external variation, the digital computer is composed of zeroes and ones but this is not the same as saying that a body is composed of cells or that bronze is composed of copper and tin. The zeroes and ones do not have substance, as they are not derived from the real, and the choice of numbers is only important insofar as it describes a primary difference – one is not the other. When it comes to cinema, we in the humanities are generally interested in understanding how digitisation affects what we see and hear. We are not engaged as programmers or hardware technicians, so for us technical aspects are only important insofar as they alter how the film creates or represents a particular sensual environment. For example, the arrival of deep focus opened up new planes of action along the z-axis and the Steadicam produced a moving image that better corresponded to our own peripatetic movement. One of the key changes brought about by digital media is the production of an image with much greater plasticity because it is not tied to a material base such as celluloid and, by extension, does not require the profilmic event for its manufacture – an image in all its plenitude can be produced digitally. In The Language of New Media Lev Manovich attributes this malleability to both the digital moving image’s capacity for manipulation within the versatile virtual space of the computer and to the fact that digital images, moving or otherwise, have a common visual substance, the pixel (2001: 300). This means that in editing and other forms of postproduction work, the images do not have to maintain a connection with the format or material in which they were first produced. Once translated to the digital screen, they are available for modification using any computer-based image editing software (ibid. : 301). The celluloid image, by contrast, is always linked to the visual whole that presents itself to the camera. The continuous undivided surface of the image that is bounded by the frame is the primary unit for both the camera (what is visible in the frame) and the film (the individual photograms) and, consequently, it is often much harder to remove elements than to include them. In a computer, the pixel maintains some independence from both the profilmic event and the frame and it is just as easy to change parts of the image as it is to change the whole. Substituting single colours in an image or removing backgrounds does not present any more technical difficulty than cropping or changing the overall brightness of a set of images. The digital computer has brought about a new conception of materiality in which light and sound can be fully manipulated by digital code – the physical instantiation of the image is thoroughly determined by a language that is immaterial. This manipulability leads Manovich to argue that digital screen media bears a strong relationship to animation. In contemporary animation, the computer produces images and allows a whole range of different types of visual media to be incorporated and altered within its virtual space, with ‘live-action footage as one of its many elements’ (ibid. : 302). Animation has always operated according to a principle of incorporation, where visual differences and movements are recast in its chosen material, whether it is clay, drawing or computer graphics. In this argument, the discussion of digitality shifts from a mode of encoding and notation to a particular type of image and image making; what has changed is the substance used in production. The digital clearly describes those images that are produced or modified within a computer and, in relation to contemporary cinema, is usually conflated with the use of CGI and other forms of special effects. For the image to be digital in this conceptualisation, some form of synthetic production is required and, in line with Manovich’s own claims about animation, this places digitality within a tradition that precedes the development of digital technologies. As Thomas Elsaesser argues, the opportunity afforded by digital technologies for the use of special effects means that the digital remains part of a general tradition of ‘illusionism in the cinema’ (1998: 204). Likewise, Bruce Isaacs places the digital image within the tradition of the ‘technological’ or ‘spectacle’ image, which has always been a feature of cinema. It is technological intervention and the breaking of the indexical bond that characterises this type of filmmaking: ‘In fact, the image of spectacle cinema is most appropriately conceptualized as a technology, which would enable the spectator to divest herself of the burden of the image as either pure mediation or the reproduction of the real’ (2013: 160-61). This could apply equally to the disappearance of figures in a Georges Méliès film, to back projection in Hitchcock’s work or to the suspension of movement in The Matrix. These arguments are right to place current digital computer technology within a broader process of technological change in cinema but this can only take place by sidelining many of those properties that are specific to a digital theory of representation. It is no longer a matter of seeing discrete divisions in the digital field or linking the digital to a system of denotation. In these arguments, the digital has already been elevated metonymically to another level of discourse. It is first conflated with computerisation and the production of synthetic images and consequently contrasted with realist cinema and its indexical relationship with the profilmic event. However, once placed on the side of the synthetic, it becomes part of another trajectory – cinematic special effects and illusionism – that does not respect the division between digital and analogue representation. When the terms digital and analogue are linked to particular technological trajectories in this way, they begin to lose any capacity to describe fundamental differences in representation. Despite the fundamental difference in how the sensible world is represented, Cubitt argues that the difference between the analogue and digital is ‘minor’ because all the peculiarities of inscription are sublated in matters of fidelity, that is, the degree to which a recording remains faithful to what it records. There is an assumption that analogue media is faithful because there is a physical alignment of two continuous material processes. There is a ‘one-to-one correspondence’ between the recording apparatus and the sensual field (visual or aural) and this correspondence is reproduced in the act of viewing and/or listening. In photography, light joins the photographic emulsion to the visible object and, in doing so, creates a visible photographic surface that is, at a later time, continuous with the act of perception. It creates a physical instantiation of the object or event through a process that in some way resembles how we see objects – it is the camera lens that synthesises the light reflected off objects rather than the eye. Digital inscription also reinscribes and represents the sensible world using various technical instruments but unlike analogue inscription is not underpinned by an ontological principle of continuity. The relationship between digitisation and the real is put into question by the gaps between the recorded units but this is a ‘minor’ issue if these gaps are very small and remain unseen. There is no question that they will also become progressively smaller through improvements in sampling and the increase in the pixel counts of screens and projectors. With the increase in harddrive space and the move towards lossless formats, we are at the point where we are not able to discern the visual qualities of digital screen media in many formats, in the same way that the quality of CDs has exceeded our capacity to hear digital differences. The improvement in sampling rates and digital-to-analogue conversion has meant that there is now no objective basis for arguing that CDs produce lower quality sound than LPs. There is certainly ongoing debate as to which medium sounds better within the audiophile community, but as Kieran Downes has argued, this is largely based on the claims of audiophiles with reference to their own individual hi-fi setups as well as social and aesthetic values maintained by audiophile groups (2010: 330). The fact that the debate cannot be settled indicates that the quality of digital sound is at a point where qualitative differences between digital and analogue sound are not readily accessible to the human ear. Irrespective of the particular limits of current media, there is no question that the digital image is in the process of losing the cast of pixelation in the same way that the cinema eventually lost its flicker. For the viewer, most of the gaps or the discrete divisions between material units are not visible unless the raw files are compressed, where we can see bands of block colour or the jagged lines between shadows. Many of the other qualities that we attribute to digital visual and audio files are related to the instruments of recording rather than the digital mode of inscription. The question then remains as to whether or not the very principle of discreteness in digital media will continue to operate in a meaningful way if these divisions are becoming less visible. If the question of fidelity is put to one side, analogue visual media are still distinguished by the existence of a material trace, which D. N. Rodowick argues could take the form of human inscription or the indexical relationship between a medium and its object. The physical instantiation of the representation always distinguishes the analogue from the digital, which is governed by a numerical and algorithmic logic rather than a spatial resemblance to the object it denotes (2001: 36). Analogue media are based on resemblance and the direct physical relationship between a representation and a referent. The physical form of the representation, such as the continuous surface of a canvas in painting, operates according to the same principles as the world it describes, that is, the continuity of space and time. By contrast, the digital bypasses the relationship between the original and copy and instead founds representation on the ‘similitude’ of data and consequently does not operate within the parameters of Euclidean space. Instead it imposes its own ‘abstract computational space’ (ibid. : 211). There is no variance between image and copy because digital code, with its exact divisions between units, can be reproduced endlessly without loss. There is nothing to distinguish one copy of a file from another and consequently the notion of an original loses any value. Moreover, Rodowick argues that the universality of the digital language has erased the differences between media, with aural and visual media underpinned by the same principles of simulation (ibid. : 37). This leads to the argument that digitality has brought with it a thorough ‘desubstantialization’ of culture due to the ‘disappearance of a visible and tactile support for both image and text’ (ibid. : 212). What Cubitt sees as a minor difference in technical inscription, is for Rodowick a fundamental change in the theory and practice of representation. Rodowick is right to argue that the digital operates according to a set of principles that do not require physical instantiation and therefore can be changed, reinscribed, and transmitted without reference to a stable set of physical limits and affordances, but this does not mean that digitality operates equally across all levels of the medium. When Rodowick talks about similitude, he is referring to the capacity for code to be reproduced without loss. Everything is identical because a digital system of notation does not allow for variability in re-inscription unlike the physical trace. It does not necessarily follow, however, that digital notation eliminates the relationship between copy and original, for digital media is not limited to the copying of code, it also refers to the process of encoding or the extraction of data from the real. If we return to Manovich, digitality is not an automatic translation of sensual differences into code, there are actually a series of steps: ‘The computer age brought with it a new cultural algorithm: reality-> media->data->database’ (2001: 224-25). This model not only imposes a certain regularity and linearity on the process of transcription, it also insists on the essential difference between the stages of transcription: the transformation of reality into media is fundamentally different to the translation of media into data. Once transcribed, data is designed to be read through any computerised system without sustained reference to its physical form. However the transformation of reality into media still operates according to a set of principles that are aligned with human perception; microphones pick up vibrations, as do human eardrums, which are then converted into electrical signals, and digital cameras use lenses to focus light on a silicon sensor in a way that still resembles the focusing of light on the human retina. The whole question of fidelity in visual media is not based on an absolute conception of accuracy, but in making a copy that engages the eye in a similar fashion to the way the eye is engaged with the actual object. Rodowick’s argument that original and copy are indistinguishable fails to take into account the medium that intercedes between the viewer/listener and the code. It is true that the digital file is no more than its code but this does not mean that it remains as code when viewed or listened to, for it requires reconversion into tangible form through an interface. The idea that digital texts lead to the desubstantialization of our relationship to the real is only partly true, for we still judge a screen image in terms of how it reproduces the real. In those forms of media, such as film and photography, in which registration is derived from indexicality, each instantiation is addressed by the viewer in terms of a relationship between image and referent even when it is a member of a series. The referent stills plays a role in the reception of the image even if there is a loss of the aura of the original due to the capacity afforded by digital technologies to endlessly and losslessly reproduce it. There is no question that digital inscription is intrinsically different to analogue inscription but its differences do not necessarily operate at the level of spectatorship; they may remain latent in the encoding. This presents a problem when one of the defining features of digital representation is that the divisions are present both in the system of notation and the objects to which that notation refers. In this definition a printed literary text composed entirely of words is more thoroughly digital – there is a loss of resemblance and text is reproduced through ‘similitude,’ if we are to follow Rodowick’s line of reasoning – than any digitally encoded film because the latter obscures the division between units at the level of reception. Another complication for cinema is that discreteness, which is regarded as a distinguishing feature of digital media, is something that is also found in the division of analogue film into photograms. Cinema theory generally celebrates the capacity to overcome the gaps in the perception of movement in analogue media and this marks a significant contrast to the highlighting of the gaps in critiques of digital inscription. Garrett Stewart argues that one of the defining features of film is the erasure of the material basis of its inscription in the act of viewing. The gaps between the photograms are elided as the filmstrip passes through the projector but what is also elided is the stasis implied in each photogram as they fulfil their place within the flow of movement (1999: 5). When the division of parts operates at the threshold of visual experience, we seek always to bridge this separation and re-establish continuity, which is a perceptual principle that has been evident since Wundt’s early experiments with apparent motion. In film theory, this apparent motion is often attributed to the ‘persistence of vision’ – the retention of image due to the relative slowness of the retina – but Aumont et al. argue that what is actually at play is a visual process referred to as the ‘phi-phenomenon’ whereby ‘the spectator has mentally established a continuity and movement where there was technically only discontinuity and stasis’ (1983: 122). This phi-phenomenon is central to the linking together of photograms in film spectatorship or cels in animation. It is important to note that the establishment of continuity through spectatorship, should not be restricted to the perception of movement. The photogram’s silver halide grains suspended in a transparent base are also contracted in the spectator’s vision to form analogue shapes, lines and visual objects. In an aural environment, vibrations of molecules in the air are contracted into sounds, notes, and words. What is most important is that perception simplifies our sensual environment, which includes overcoming gaps in the medium, and this applies as much to digital media as it does to analogue media. One could argue that with digital media all that has changed is the nature of the visual objects that are contracted to create objects and movements, of which the most obvious is the contraction of pixels into fields of colour and other shapes. The difference between digital and analogue in cinema is not limited to a technical mode of inscription, it can refer also to ways of seeing. Human perception is driven by gestalt principles in which there is a reduction of the number of differences in favour of simpler visual forms. This may be attributed to the fact that human perception is analogic, insofar as there are no absolute divisions in consciousness or the various sensual fields. This continuity is mapped onto new discrete sensual data, as is the case in the contraction of differences between pixels, samples or photograms. But this is not a one-way process where the digital becomes analogue, for our perception also imposes its own divisions on the perceptual field that correspond to the denotative divisions of language. This opens up a new line of inquiry that does not fully depend on the manner in which media files are encoded but rather on types of perceptual engagement. To highlight what is at stake, it is worthwhile returning to Garrett Stewart who makes an interesting comparison between the contraction of photograms to form a moving image – what he calls photo synthesis – and the fusion of letters into lexical units in the reading of text: ‘Filmic frames flickeringly disappear into cinematic image rather as the fluctuations of alphabetic language congeal into units of meaning on the page’ (1999: 2-3). Phenomenologically the two forms of contraction are comparable, as both the movements associated with reading and viewing look to overcome differences through the joining together of parts. However, the reading of words creates simpler units not only through the joining of letters but also through imposing a gap between words. Digital distinctions are introduced in the act of creating unities. There is always a tension between analogic continuity and the deployment of that continuity in creating meaningful units. Even in cinematic photosynthesis, digital and analogue are combined. The photograms are fused together on screen to produce an image that continuously varies but our attention is also drawn to clearly defined visual objects – most often figures and their movements – which stand out as identities. In a sense, every single photogram, and not just the joining of shots, is governed by a match-on-action. The intermixing of the analogue and digital in perception can be understood through a variety of frameworks but in order to remain consistent with the use of the terms in the sciences, it is best described primarily through a theory of information. Fred Dretske argues that analogue and digital perception might be premised on the difference between the continuous and the discrete, but this difference also yields different types of information. The digital ‘signal carries no additional information’ other than its ‘digital form’ whereas the analogue signal ‘carries more specific, more determinate, information’ (1981: 137). To refer to the earlier discussion of difference, the digital signal carries meaning solely because it encodes difference and this contrasts with the analogue signal which is comprised of a whole array of differences embedded within a particular physical instantiation. To exemplify this difference, Dretske explains how we would communicate that a cup contains coffee, analogically and digitally. Digitally, the message can be communicated very efficiently in a short linguistic statement such as ‘the cup contains coffee.’ The message is efficient because the denotative language has already extracted the necessary units of information and given them a name. The analogue message, by contrast, requires physical resemblance to communicate the message, for example by using a picture of a cup containing coffee. The picture cannot just present the necessary information – coffee in the cup – because in the presentation of this information it must also refer to a specific object and its details. The cup must have colour, shape and perspective and the approximate amount of coffee must also be shown (ibid. : 137). Even with such detail and specificity, the picture is not exclusively analogue for there is linguistically encoded digital information that is embedded in the picture alongside a range of other integrated properties (ibid. : 138). Indeed, for the picture to have any meaning, the key features still have to be recognised, which entails extracting digital differences from the material and analogic form of the image. In all cases from perception to digital recording, the conversion of an analogue signal to a digital one requires the loss of information. According to Dretske, all the specific differences that are contained in the analogue are contracted into an identity that can be read by the digital system. The digital system transforms variability into identity by discarding those aspects that are not relevant to its structure of representation: ‘The more specific pieces of information it carries are systematically ignored in order to achieve a uniform response to relevant similarities’ (1981: 141). This digital extraction becomes the guiding principle of Dretske’s epistemology, for it is only through the transformation of the perceptual field into digital units that knowledge becomes possible: ‘Until information has been extracted from this sensory structure (digitalization) nothing corresponding to recognition, classification, identification, or judgement has occurred – nothing, that is, of any conceptual or cognitive significance’ (ibid.:153). Although Dretske is talking about human perception, this notion of extraction can be compared to the sampling of information through digital input devices and the organisation of information in a database. It also constitutes a form of double encoding. There is first the separation of information from the analogue and, secondly, the placement of this extracted information in a system of classification that does not recognise the material context from which the information was derived – in Manovich’s algorithm, the process from media to data to database. The process is valuable as a way of thinking about cinema because it demonstrates that the analogue-digital distinction is always operative regardless of the medium under investigation. Arguing that digital and analogue are different modes of cognition allows for a much more direct discussion of how the terms can be applied to cinema, in particular in their aesthetic application. The problem with adopting a technical viewpoint is that the digital divisions in the technology are not necessarily apparent at the level of perception. Conversely, our perceptive apparatuses impose digital divisions regardless of the film’s material foundation. Interestingly, it can also be argued that digital technologies actually facilitate an analogic engagement with screen media. Software tools and various forms of interfaces, such as the mouse or a toggle, can be used to change the speed of a film or merge sequences. The continuous variation of the screen image is coincident with the movement of the body and is not experientially mediated by a discrete system of notation, as is the case with the use of a keyboard, and is therefore analogic. The screen image also operates within a general analogic framework because the message is always embedded in a visual field that is spatially and temporally continuous and is often linked through resemblance to a profilmic spatio-temporal field. There is always a tension between the analogue and the digital in perception and therefore it does not make sense to categorise a frame, shot or film as fully occupying one category or the other. It is more appropriate to regard aesthetic practices as placing more emphasis on either the digital or analogue, encouraging the viewer to attend to digital differences or analogic plenitude. Rather than clearly divided states, there is a tendency towards either the analogic or the digital as a matter of style and the filmmaker’s way of thinking. The image becomes authentically cinematic when (amongst other things) not only does it live within time, but time also lives within it, even within each separate frame. This argument is derived from Tarkovsky’s belief that film’s primary aesthetic is not the separation of the film into shots, or indeed the film strip into photograms, but rather what he refers to as the “time-pressure” within each shot: ‘The course of time, recorded in the frame, is what the director has to catch in the pieces laid out on the editing table’ (ibid. : 117). Making reference to the fact that the image is always embedded in time not only distinguishes the truly cinematic but also reasserts the image’s indexical relationship to the real. The image is authentic if it is linked to the very movement of life and this can include physical objects as much as the action of living beings. There is temporal continuity which embraces all things seen and experienced in which time-pressure ‘is a pointer to something stretching out beyond the frame and to infinity; a pointer to life’ (ibid. : 117-18). The indexical function in this case is not only a means of linking the image to a particular place or event, but a means of gesturing to the ongoing process of life that continues through the materiality of the objects and images that comprise it. To explain time-pressure, and for our purposes to explain an analogic approach to filmmaking, Tarkovsky refers to the short film Le Dormeur by Pascal Aubier (1974) [online]. The duration of the film is nine and half minutes and conducted in a single take and the only notable event is the discovery of a dead insurgent. What makes the film interesting is not the depiction of this event but the fact that the body is only revealed in the final few seconds of the shot, where the death of the insurgent is implied by his blood stained shirt [Figure 1 below]. 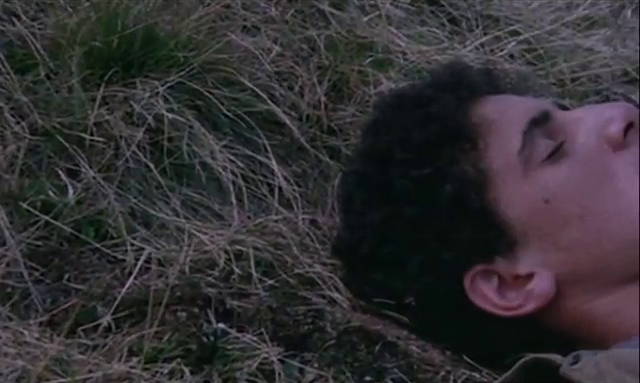 The protagonist is not even shown until 6:57 [Figure 2 below], and at first the viewer assumes that he is merely asleep, hence the conceit in the film’s title. There is no question that the film is organised around the revelation of the insurgent’s death – Aubier uses similar revelations in other short films such as La Mort du rat (1973) and Le Voyage de Monsieur Guitton (1969) – but, for Tarkovksy, what makes this film an example of good filmmaking is the time-pressure of the first two thirds of the film as the camera moves through a secluded woodland [Figure 3 below]. 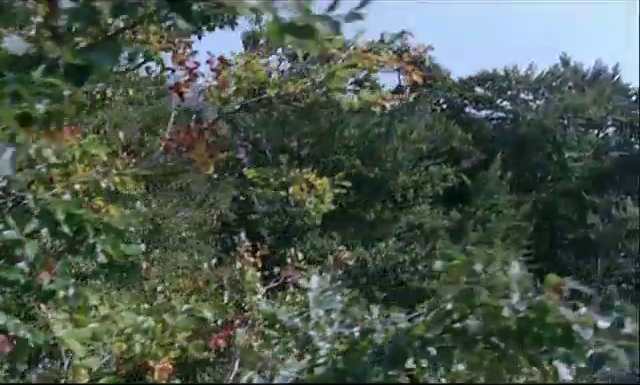 He argues that the rhythm of this natural environment becomes the ‘sole organising force’ of the shot – although it should be mentioned that Tarkovsky does not acknowledge the camera’s role in fashioning this rhythm. Moreover, this rhythm of the woodlands is also aligned with the viewing time, where ‘[t]he passing of time seems to be speeded up, driven on by our curiosity’ (1989: 114). There is sensual pleasure in following the visual rhythms of the woodland, hearing plants rustling in the wind and the intermittent sounds of insects but this is also balanced against the expectation that something should happen. The principles of filmmaking that Tarkovsky celebrates, which he found in the first part of this film – the continuity of lived time, the rejection of symbols, the focus on the particular and concrete – are principles that can be coordinated using the digital-analogue opposition. Digitally the film can be summarised as a set of statements: the man is lying on the ground, the man is sleeping, the man is dead. This can be likened to Proppian narratology which also sought to devolve narrative into key figures and actions that are separated from the material or physical continuity of the world in which they are enacted. The digital is the what-is-happening of the film over and above the analogue properties that provide the material support for this information – what the man looks like, the clothes he wears, the texture of the ground, variation in light, etc. It refers to those aspects of the film that can be extracted and encoded in a language, in this case linguistic statements placed in a narrative sequence. The ‘curiosity’ that Tarkovsky refers to is partly related to a digital mode of thinking, for the viewer looks to extract meaning from what they are seeing, to give it a definite value. The death of the insurgent serves as the meaning that defines the whole. However, this is not what Tarkovsky values in filmmaking, for a film should not be reducible to a single meaning or symbol but should respect the particularity of the image and the movement of life. What he most values then are the analogic aspects of cinema that exceed any form of digital statement. In relation to the question of time, what Tarkovsky highlights is lived time which has no clear divisions and is essentially analogic and is distinct from clock time which is composed of discrete units that are organised using a notational scheme. In lived time the past continuously affects the present and as such creates or exerts a time-pressure. In Le Dormeur the natural rhythms have their own time-pressure found in the continuous intermingling of all the parts, from the movement of leaves through to the changing of light. The period of watching these natural rhythms prior to the appearance of the insurgent also constitutes a type of time-pressure, found both in the continuity of the shot and in the delaying of the reveal. The imposition of digital value – the realisation that the sleeper is actually someone who has been killed in battle – breaks this time-pressure and consequently the film ends at this point. The opening section of Le Dormeur accentuates its analogue properties not only in the representation of the continuity of natural rhythms but also in the way in which it delays and resists digital meaning. What does it actually mean for a film to resist digital closure and highlight the analogic? The best way to approach this issue is to turn to another aspect of analogue representation, the notion of density. Nelson Goodman argues that in analogic representation there is always the capacity to interpolate further points between any two existing points in the notational system and the processes, events or field to which it refers. A notational scheme ‘is syntactically dense if it provides for infinitely many characters so ordered that between each two there is a third’ which means that there is no means of imposing absolute clear breaks between the parts (1968: 136). In the first two thirds of Le Dormeur, the shot does not have a syntactical structure through which the visual field can be properly differentiated into narrative elements – individual figures are not isolated or pursued in the course of their action. There is no clear narrative logic that privileges one object above others and everything that is given a name or value can be further differentiated. If the viewer focuses on a tree for example, nothing prevents a further process of differentiation in which attention is drawn to the bark, the leaves, the texture of light, etc [Figure 3 below]. There is no readily available digital notational system to contain the meaning. This analogic density of the image relates also to Tarkovsky’s claim that film images should not stand as symbols and should instead reveal something that is real and absolutely true. This notion of density is a principle of realism that operates in the interstices of the analogue and the digital at the point where digital meaning is exhausted. Norman Bryson, with regard to painting, argues that the realist image can be distinguished – in its gesturing to the plenitude of the real – by the way information is presented in a form that overwhelms the discursive structure. The realist image is closer to the figural than the discursive because ‘[i]t supplies us with more visual information than we need to grasp its narrative content, and more than we can recuperate as semantically relevant’ (1981: 10). The greater the density of the screen image and the less it is determined by a notational scheme, the more it emphasises an analogic way of thinking. If analogic filmmaking emphasises the specificity and variability of the physical instantiation, digital filmmaking emphasises the film’s discursive structure. It clearly places each event within a structure of meaning that is coordinated by the narrative. One could refer to the obvious examples of action films which constantly direct the viewer to narrative events and, due to the speed of the editing, allow little time for contemplation of the visual plenitude of the mise en scène. However, another way of looking at the issue is to consider those films that begin with a thoroughly digital premise. If we draw again upon Tarkovsky’s writing, the analogue film is one that retains the time-pressure of the world to which it indexically refers. Because the analogic film remains continuous with the indivisibility of life it can only be decomposed into parts after the fact. A digital approach would accept a pre-existing division of parts that corresponds with the syntactical divisions of a notational scheme, and from these parts the continuous whole of the film would be constructed. The clearest example of this type of approach is in the creation of films using fragments from other films. This practice has become more common due to the capacity to reproduce digitised films without reference to the original negative, which has led to a surfeit of available material. This material is not just stored on individual harddrives but available on the internet through video aggregators, websites and other types of databases, with the most readily accessible material those film fragments uploaded by fans on YouTube and Vimeo. Digital media encourages us to think like bricoleurs, because film sequences can be easily separated from their context and once separated their value is determined by their place within an index or incorporation into another film. 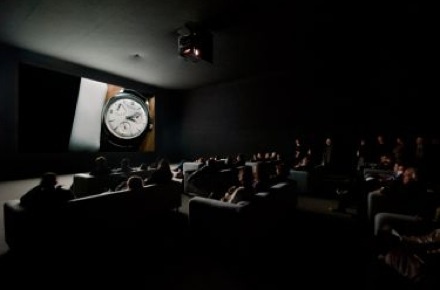 A salient example is Christian Marclay’s video installation The Clock, which is composed of fragments, each of which refers to the passing of time. The installation runs for 24 hours to replicate the clock-based description a day and the fragments are chosen because they directly reference time-keeping devices [Figure 4 above]. The film incorporates a wide variety of other films and one of the pleasures the audience derives from watching it, or more likely segments from it, comes from recognising the origin of the fragments. In itself, this type of pleasure conforms to a digital logic where the visual specificity of the scene gives way to recognition. In Dretske’s terminology the viewer extracts relevant information and in its simplest form, this is little more than the name of the film cited. It is an indexical reference but not one that points to the specificity of lived time or even the filmic context, for it refers only to the film as if it occupies a place within an ahistorical database of known films. Even if the viewer engages more directly with the diegesis, there is still a reduction of the film’s analogic time-pressure, because the main aim is to spot the time keeping device, and thus confirm the film’s premise, that each fragment conforms to the passing of chronological time as measured by clocks. The length of the shot is not determined by its intrinsic value, or the general expression of the course of time, but rather by the necessity that the film as a whole equates to 24 hours. The whole film is structured around digital difference where the value of each temporal signifier is determined by its capacity to distinguish itself from other temporal signifiers, and the value of the image is enfolded into the digital structure of the sign. The application of the notational system, clock time, effectively flattens out the image and reduces the viewer’s inclination to attend to its concrete particularity. It is similar in many respects to how the naming of colours reduces the variability within any one colour or its place within the continuity of the spectrum [Figure 5 below]. Because we only look for what confirms it as a sign, each colour becomes an identity and loses the material variability that characterises it. The American minimalist painter Ellsworth Kelly explores this relationship when he reduces the variability of the spectrum to colour fields. 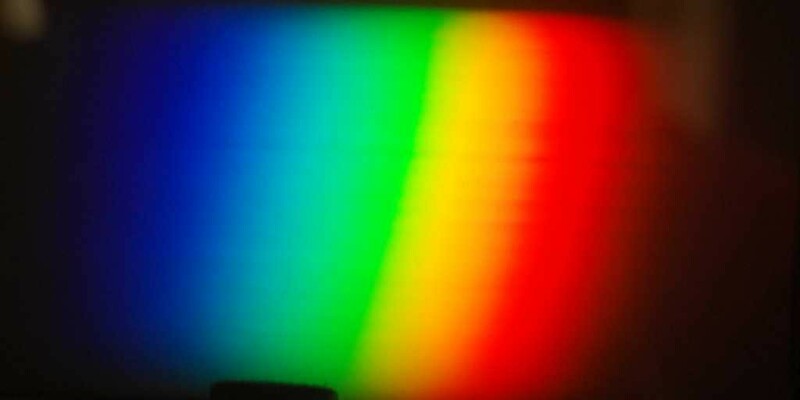 In his Spectrum III (1967) [Figure 6 below] colours do not form a continuous series but are instead defined by an indexed series of steps linked to the identity of the particular paints – digital sequence replaces analogue variability. In Marclay’s film there is an indexing of times rather than colour and despite the many references to analogue clocks, the film is essentially a digital clock. The shots all point to a digital value – the discrete time displayed on the face of each clock – that is closer to the index at the back of a book than it is to profilmic indexicality in film, television and photography. When Tarkovsky speaks of film as being a pointer to life, he is interested in something completely different. One could call it an analogue clock where the clock face is without notation and where the pointer does not simply point to a specific time or event, but rather resembles an index finger that runs across a textured surface noting its infinite variability. If digitality is to continue to be useful in the analysis of cinema, it cannot be simply a term appended to a type of technology that employs digital encoding. This would lead to the incorrect assumption that whenever such technologies are involved, the principles of digitality are also operative at the level of spectatorship. Does it make sense to argue that a Tarkovsky film is digital if we watch it on DVD or as a digitally projected image? As a mode of inscription, there is no doubt that it is digital, for what is assumed by the spectator to be the infinite variability of the visual field – the same applies to the aural field – is actually a collection of discrete colours assembled into an array. But this does not mean that viewing digital and analogue images is fundamentally different, for watching a celluloid print of the film at a cinema is similar to watching a digital image at the same venue, but quite different from watching the same film on a computer where the viewer always has the capacity to stop the film. With regard to the latter point, Laura Mulvey argues that the act of halting or slowing the image afforded by video and DVD changes the nature of spectatorship. The spectator’s alignment with the gaze of the character and film movement is disrupted by the spectator’s activity and this leads to a defamiliarization of those filmic fictional codes derived from presentness. There is a greater emphasis on the pensive and possessive modes that extract images from the immanence of the film’s diegesis (Mulvey 2006). This is not a digital effect, although it is afforded by computational technologies, because it encourages the spectator to focus on the specificity of the image and its analogue variations. In contrast the film played at its original speed might place greater emphasis on narrative sequences, which can be interpreted digitally. Whenever we use the term digital, we have to think not only of what it refers to but also if it still operates in opposition to the analogue. There is no question that distribution and reception have changed fundamentally with digital media platforms, but could we describe the old forms of distribution and reception as analogue? They certainly involved analogue copying, with the requisite physical instantiation, but the slow process of transporting reels of film across the world and the commercial systems attendant on this distribution can hardly be described as analogue. Perhaps we should devise new terms to describe this process – for example replicative technologies or networked distribution – rather than further overburden the word digital. To retain the critical value of digitality involves resituating it in relation to analogue modes of representation and understanding how both terms describe ways of organising information. The digital and analogue are always co-present in every film and this co-presence operates at a number of levels from the composition of the film to spectatorship. This is why it makes no sense to say that a film is either digital or analogue but one could argue that some films have a tendency towards or accentuate the digital, whereas others derive their aesthetic value from a tendency towards the analogue. These issues extend well beyond the appreciation of film and in many ways are at the very centre of humanities research where we must always ask, to what degree do we insert ourselves into the temporal particularity and haecceity of the world and to what degree do we reconstruct the world as data. PAUL ATKINSON, the copyright holder of the above work, shares it here under a Creative Commons Attribution-ShareAlike 3.0 Unported License (CC BY-SA 3.0). In any future uses of the work, please also acknowledge SEQUENCE 4.1, 2016, as its first place of publication. All images reproduced above derive from frame grabs or low res online images. All sources are acknowledged in the text. They appear here solely for Fair Dealing (and Fair Use) purposes of scholarship and criticism. Aumont, Jacques, Alain Bergala, Michel Marie and Marc Vernet (1999), Aesthetics of Film (Austin: University of Texas Press). Blachowicz, James (1997), ‘Representation beyond Mental Imagery’, The Journal of Philosophy, 94:2, pp. 55-84. Bryson, Norman (1981), Word and Image: French Painting of the Ancien Régime (Cambridge: Cambridge University Press). Cubitt, Sean (2006), ‘Analogue and Digital’, Theory, Culture & Society 23:2-3, pp. 250-51. Downes, Kieran (2010), ‘”Perfect Sound Forever”: Innovation, Aesthetics, and the Re-making of Compact Disc Playback’, Technology and Culture 51:2, pp. 305-331. Dretske, Fred I. (1981), Knowledge and the Flow of Information (Cambridge, Mass. : The MIT Press). Goodman, Nelson (1968), Languages of Art: An Approach to a Theory of Symbols (Indianapolis, New York, Kansas City: The Bobbs-Merrill Company). Isaacs, Bruce (2013), The Orientation of Future Cinema: Technology, Aesthetics, Spectacle (New York and London: Bloomsbury). Manovich, Lev (2001), The Language of New Media (Cambridge, Mass. : MIT Press). Mulvey, Laura (2006), Death 24x a Second: Stillness and the Moving Image (London: Reaktion Books). Rodowick, D. N. (2001), Reading the Figural, or, Philosophy after the New Media (Durham and London: Duke University Press). Stewart, Garrett (1999), Between Film and Screen: Modernism’s Photo Synthesis (Chicago and London: University of Chicago Press). Tarkovsky, Andrei (1989), Sculpting in Time: Reflections on the Cinema, trans. Kitty Hunter-Blair (London: Faber and Faber). Wilden, Anthony (1980), System and Structure: Essays in Communication and Exchange 2nd ed. (London: Tavistock). The Clock. Dir. Christian Marclay, 2012. Exhibition. Sydney: Museum of Contemporary Art.